Guerrilla art installations have a long and checkered history, and one might argue that it's one of the few remaining artistic styles that can provide genuine surprise and shock to the viewer, thanks to the inherent unexpectedness of running into a piece of art where you least expect it. A perfect example is the social media firestorm that was triggered by a piece of guerilla sculpture that was installed in a New York City park on April 6th, 2015. Unfortunately, the piece was rapidly removed (extremely surprisingly rapidly, considering that city officials were responsible), but not before some excellent photos were captured and submitted to the social media news website Mashable. 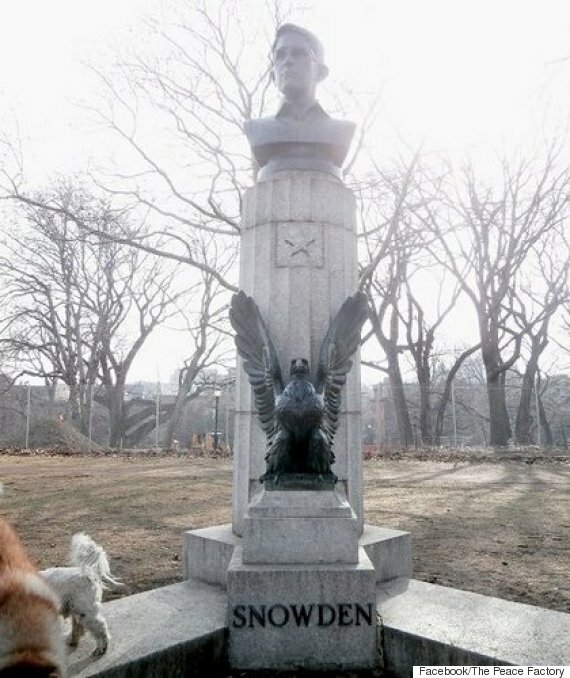 The piece is extremely controversial, which is probably a large part of the reason that officials were so eager to remove it: it was a bust of Edward Snowden. 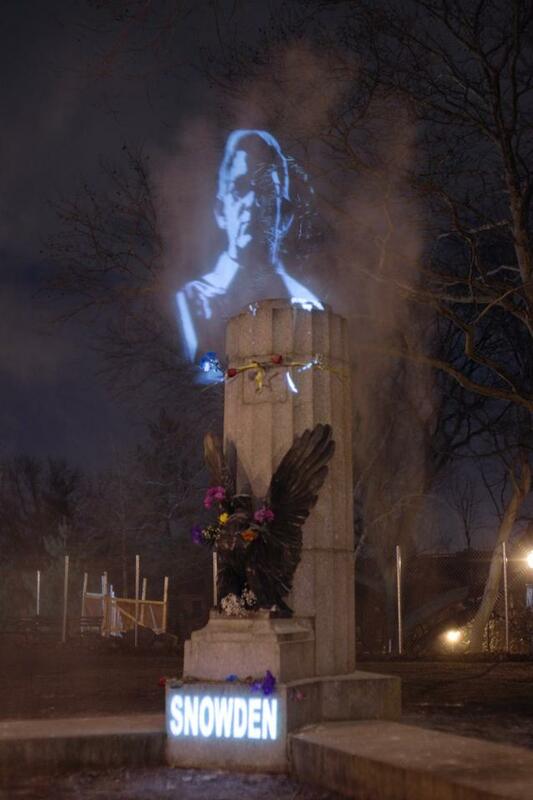 Installed in Fort Greene Park in Brooklyn, it was actually mounted atop a prior memorial dedicated to prisoners of war who died on British prison ships during the American Revolution, which is no doubt at least partly responsible for the rapidity with which the New York Parks department covered and then removed the piece. Perhaps amusingly, Mashable reports that the artists had entertained hopes that that statue would attain permanent residency in the park, which is remarkably naive, if true. Whether you believe he was a heroic whistleblower that exposed massive government surveillance programs or that he was a traitor who betrayed American security, it's hard to deny that Snowden is a pivotal figure in current geopolitics. Whether that means it's appropriate to idolize him at the expense of other memorials is maybe outside the scope of this short post, but the artists did make some interesting comments about what they hoped ooto accomplish with the piece. Speaking to Mashable, the artists responsible for the piece explained, "This is a guy who some of the traditional mass media has portrayed as a traitor, or a terrorist, and the very same thing would have been said about these POWs in the Revolutionary War times. But with 200 years of perspective, we realized they were fighting for something all of us are very grateful for. We hope it will shift people’s perceptions, or open their eyes, that there could be a different story than what they’e been told." It's long been the case that repressive regimes tend to strike first at the creative community with censorship and other weapons, but it seems like something of a stretch to claim that this is what's currently happening in America. Regardless, this art installation forced Snowden back into the public consciousness, demonstrating again that media savvy is one of the most important tools when it comes to freedom of speech.